The Huawei MediaPad M5 8 is a new 8.4-inch Android tablet with a full metal body, powerful hardware and premium features like a fingerprint scanner. In addition to that, it is one of the first tablets to ship with Android 8.0 Oreo. The MediaPad M5 8 packs a lot of interesting features. Let’s get to know it in more detail. The Huawei MediaPad M5 8 looks like its predecessor which is the MediaPad M3. It features a full metal body with a high-end build quality. On the bottom, we get a USB Type C port and a microSD card slot as well. Underneath the screen sits a fingerprint scanner and there are two soundbars placed on the top and bottom. The speakers are developed together with Harman/Kardon and are said to offer great sound. With a screen size of 8.4 inches, the tablet is a direct competitor to the Apple iPad Mini. However, its IPS display offers a much higher resolution of 2560 x 1600 pixel. That means that the pixel density is 359ppi which is noticeably higher than most premium tablets. Like most tablets of this size, the screen does not support an active stylus. 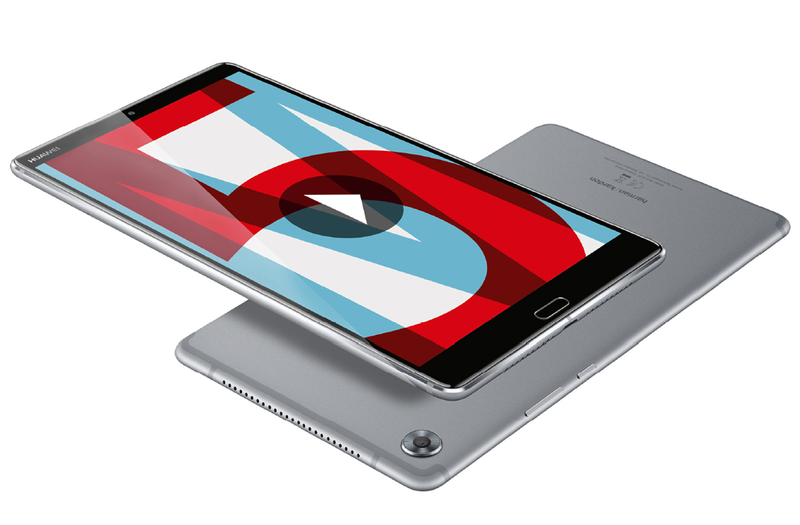 Inside the MediaPad M5 8 runs a HiSilicon Kirin 960 octa-core processor. That SoC features four Cortex A73 cores clocked at 2.4GHz and four Cortex A53 cores clocked at 1.8GHz. As of spring 2018, that makes it one of the fastest Android tablets available. In addition to that chip, it ships with 4GB of RAM and 32GB of internal storage. Other options include 64GB and 128GB of storage, as well as optional 4G LTE. The version with LTE supports text messaging, phone calls and a hotspot feature. The M5 8 is one of the first tablets to ship with Android 8.0 Oreo. However, the interface is heavily customized with Huawei’s EMUI. The Emotion UI is very similar to previous generations. While it customizes Android a lot, users can customize it themselves a lot too. You can choose between a lot of designs, different animations when swiping through the home screen or whether you want to display the app drawer or have all apps installed on the main screen. There are a lot of pre-installed apps as well. Some of those can be removed while other cannot be uninstalled. There are a couple of interesting alternatives to the MediaPad M5 8. While there is no higher-end 8-inch Android tablet available, you can get cheaper competitors. That includes the older MediaPad M3 which packs a lot of similar features and almost the same display. It is not as fast as the M5 but offers similar premium features like a full metal body, a fingerprint scanner and great speakers. If you are looking for something that is a lot cheaper, you can check out my reviews of the Huawei MediaPad T3 8 and Samsung Galaxy Tab A 8.0 2017. Both competitors are very similar, much cheaper but offer lower-end hardware. You might want to take a look at lesser known Chinese tablets as well. The Teclast Master T8 is not as powerful, but has a similar screen, a decent performance, a fingerprint reader and is much cheaper as well. If you prefer iOS as an operating system, there is the iPad Mini to look at as well. Another Chinese competitor is the Chuwi Hi9 Pro. While it is not as powerful, it is much cheaper and has a similar high-resolution display. Oh, and it has a metal body and Android 8.0 Oreo. The Huawei MediaPad M5 8 will be hitting stores in March 2018 and prices start at 349 Euros. Huawei did not announce US pricing yet but prices should be similar in every market. The tablet is expected to be sold all over Europe including Germany, Britain, France, Spain, and Poland. It will be available in Asian countries like Thailand, Taiwan, Japan, India, and Indonesia as well. American countries like the United States and Canada should be able to get it too. The Huawei MediaPad M5 8 is the best 8-inch Android tablet on the market right now. It features a high-resolution display, fast internal hardware and recent Android 8.0 Oreo. In addition to that, we get premium features like good speakers and a fingerprint scanner. However, one major downside is its missing headphone jack. Huawei MediaPad M5 8 Review: The Best 8-Inch Android Tablet?